How would you describe the current scene for the hospitality sector in India? Hospitality in India is growing. With the kind of investments being made in this industry, as well as the various new brands coming up, it’s a hard trend to ignore. Marriott International itself has a hundred hotels with a vast portfolio of brands in India, and does not find itself travelling to metropolitan cities alone, since large-scale demand has also been mapped in tier two and three cities. Some very exciting brands in the resort and wellness hotels segment have been added to its portfolio with W Goa, JW Marriott Mussoorie and very recently a Marriott in Jaisalmer. This is only reflective of how aware of and willing to consume our product alternative markets are. Additionally, there is a growing population of corporates in the silicon valleys of Bengaluru and Hyderabad, with high purchasing power and a growing inclination towards the finer things in life. The startup ecosystem has also supported us well by creating buoyancy in the market to meet the increasing supply. Hotels 10 years ago were seen as uptight spaces of luxury, but with time and a shift in paradigm, luxury has evolved to become more reflective of consumer wants and needs while maintaining old school quality standards. 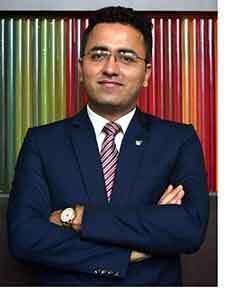 Marriott International has opened some rather new and quirky brands like Renaissance, and has just recently signed up a 13th Aloft in India within its luxury segment to address the burgeoning mid-scale and upscale demand. It has also been observed that the business traveller is content with a comfortable bed, crisp service and a good coffee shop without the additional frills to meet its basic needs. So the value propositions we offer count more in that sense and the latest of this is a first-of-its-kind in-hotel pool side micro-brewery at JW Marriott Hotel Bengaluru. Of course hotels are reinventing in the food and beverage space, and becoming more technologically savvy to cater to the growingly tech savvy millennial traveller. What are the challenges for hotels to cope with to drive growth and revenues? Competition right now is at an all-time high with Marriott International itself running approximately 30 brands across the world, and 15 brands in India. This is in addition to new brands being added to the market by different hospitality chains and companies on an almost quarterly basis. Airbnb is another sector that poses a challenge to the concept of experiential stays most luxury hotels provide, and with standalone F&B (food & beverage) outlets stealing spotlight from luxury dining hotel outlets. Therefore driving growth and revenue is not the same ball game that it used to be even half a decade ago. To have our voice heard in this almost sonic boom JW Marriott Hotel Bengaluru, among other Marriott International hotels, have placed monetary as well as emotional investment in digital marketing and social media platforms. Our sales team also spends time working on relationships across segments of users, instead of just the end-user as it traditionally used to be, and works towards understanding customer and consumer needs instead of hard selling a product that wouldn’t be optimised to their requirement. We have also realised that this focus on relationships enables us to serve our guest with the honesty they deserve, which enhance their satisfaction ratings that drive our consumer base when reflected on online travel agencies. Additionally, retaining the best people the company has groomed and rolling out programmes for people fresh out of college across departments help us find the human resources we require to run a task as ambitious as this one. How do guests from India and abroad select a hotel going by the competition in this space? Guests from abroad usually select their hotels through online travel agencies and e-channel partners and based on the loyalty rewards each hotel provides them with. Marriott International has recently integrated their loyalty programme to include Starwood Proffered Guests and the Ritz Carlton Rewards to Marriott Rewards, and this in addition to location determines which hotel travellers eventually book. Once a traveller considers Marriott International, the portfolio they can choose from is vast. Attracting domestic travellers has been a challenge, but to encourage people from our own country to stay with us we invest in digital campaigns to connect directly with our guests and eliminate middlemen who might not adequately represent what we can offer. Guests usually select their hotel based on location, purpose and budget, but today, people are willing to spend that little extra to upgrade their experience. How rational are the room tariffs in a phase where inflation is rocking expenses? Luxury hotels don’t price their rooms irrationally anymore. JW Marriott Hotel Bengaluru and Marriott International work on the basis of hotel positioning, customer feedback, hotel expenses and market demand and supply relations to determine their room rate. Earlier, iconic hotels in cities like Mumbai and Delhi charged $350 per night, but now the rate fluctuates around $150 because we keep our ears close to the pulse of our target audience and their spending power. How easy is to get the right workforce for your properties and how much training is required to make them job-ready? Unlike in earlier times when a college education in science was the norm, this day and age is seeing a lot of people deciding to pursue a career in hospitality right from when they’re in school. Because of how integrated into their lifestyles hotels have perhaps become, and the very visible boom the industry is currently going through, parents are also being supportive of such a career choice, leading to an increase in the talent-pool we can choose from while recruiting. A large number of hospitality schools and colleges have also opened up across the country providing undergraduate courses in specialised streams like culinary, human resources, sales and the likes, allowing our potential employees to be trained before they actually join the industry. Post- joining, Marriott International too runs its own training programmes on its intranet, so any previous skills or innate talent can find itself being groomed or developed to organisational standards. Are today’s hotel management courses relevant for industry needs? Today’s courses need an upgrade and need to be integrated with hotels to understand the level of innovation and creativity that goes into running a hotel in this market climate. While we allow our guests state-of-the-art facilities at their disposal, it is important for the hospitality industry to provide for budding hoteliers to experience and understand these technologies to be able to excel in their profession. So while they might be doing a good job getting people work-ready, paying closer attention to industry needs will help create illustrious careers for their students.